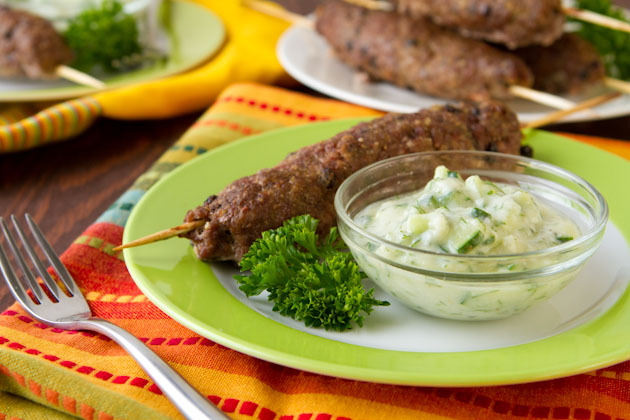 Delicately spiced beef kabobs sprinkled with sweet currants, served up with a side of fresh dairy-free tzatziki. Preheat oven to 375F and place 6 bamboo skewers in water. 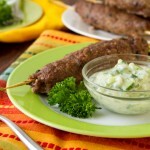 To make the tzatziki, cut cucumber in half lengthwise and remove seeds with a spoon. Chop up into small pieces. Mince garlic into a bowl with all ingredients. Stir to combine, cover and place in the refrigerator to help develop the flavors while you cook the kebabs. To make the kebabs, drop all ingredients into a large-sized bowl and mix with your hands until incorporated. Separate the meat mixture into 6 even portions and begin to shape handfuls of the meat mixture into sausage-like shapes, about 5 inches long around the soaked skewers. Place completed kebabs on a parchment paper lined baking sheet. Repeat with remaining meat mixture. Once complete, bake in the preheated oven for 25-30 minutes or until internal temperature reaches 160F. Remove from the oven, plate with tzatziki and serve. For the barbecue, preheat grill. After it’s preheat, oil your cooking surface and place assembled kebabs over top. Grill approximately 6-7 minutes per side.